We are completely inspired by our clients and we believe that shows through in our work. Whether your style is modern, transitional, eclectic and beyond, we are excited to help you bring your best self forward. We invite you to browse our portfolio and we look forward to hearing about what inspires you! Emily’s pied-et-terre provided her with the perfect landing spot to unwind and entertain. Showcasing her unique style, a blend of rock-n-roll and Hollywood regency, Emily’s shoe collection provided an excellent inspiration. We selected materials and a color palette that brought her vibrant personality to life. This classic Marina Pied-a-Terra was a joy in so many way. Mark and Caim relocated to San Francisco from LA wanted to turn their spacious SOMA loft into a home that reflected their eclectic taste and would serve as a wonderful place to entertain their friends and family. We fed their sense of interior adventure by adding a dining lounge across from the traditional dining room which features a hand painted mural and serves as the "nucleus" of the home. The rich color palette and unique furnishings and art tell the story of a passionate couple who love to live outside the box. Will, a jovial bachelor, risk taker and successful doctor was feeling quite confined by the kitchen in his beautiful Edwardian flat in the Upper Haight. With its good bones and sprawling views of San Francisco, this home had all the potential it needed. We set out to connect a few small and disjointed spaces to create one flowing and useful space where Will can cook, entertain and relax. Previous layout was cramped, dark, felt disjointed and heavy. Stove and sink were repositioned and a breakfast nook added providing a more flowing layout with tons more usable space and natural light. Community and flexibility were the main drivers for Dana and Lloyd during their extensive architectural endeavor. Contributors to many organizations, they wanted a place to gather in large and small groups. Their art collection offered an anchor to the interior shapes, materials and elements. Their biggest request of all, COLOR! -Lots of color. We worked with MacCracken Architecture and married modern lines with classic elements. As a nod to Alexander McQueen, the inspiration for Matt and George’s home came from a collection by the Great. Taking a queue from McQueen’s razor clam dress, we created a cascading stone fireplace wall to cozy up in front of. We played with textures and patterns, coupling wood with steel, lacquer with leather and hide with wool, all against a backdrop of soothing plaster. The Valerie dining chairs and Otto table elegantly counterbalance the walnut block canopy in the dining room. It is a space that is as refined as it is relaxed, describing our clients to a tee. Vineet is a brilliant, modern man. He's also a risk-taker who wanted his home to reflect his personality and ethnicity. We used color to achieve both! When looking for a San Francisco Interior Designer he wished for three specific things: surprise, to stay on budget and to be daring. The geometric patterning is a predominant theme echoed throughout. Tina Sedonne's sculpture highlights strength and fluidity. Tahiti Pehrson's 4' x 10' cut paper piece signifies inter-connectedness and also echoes the negative space created by both the coffee table and steel chandelier. Our re-imagining of this San Francisco Edwardian was very rewarding, a true gem transformed. We were able to convert a once dark kitchen into a sun-drenched area. We combined the WC and single bathroom, making things spacious and calming. We also added a second WC under the stairs. Marty's loft, with its high ceilings and exposed metal beams called for a bit of grounding. We used plants and lined an entire wall in a zebra wood veneer. Juxtaposed with the wood wall is a steel and concrete kitchen with a custom live-edge walnut bar. The custom-mixed concrete counter tops added just the right amount of texture to the black and white palette of this San Francisco interior. Upon purchasing their first house together, this young couple set about transforming it into their dream home. As they embarked on starting a family of their own, they undertook a major renovation to this Elegant Fremont Home. 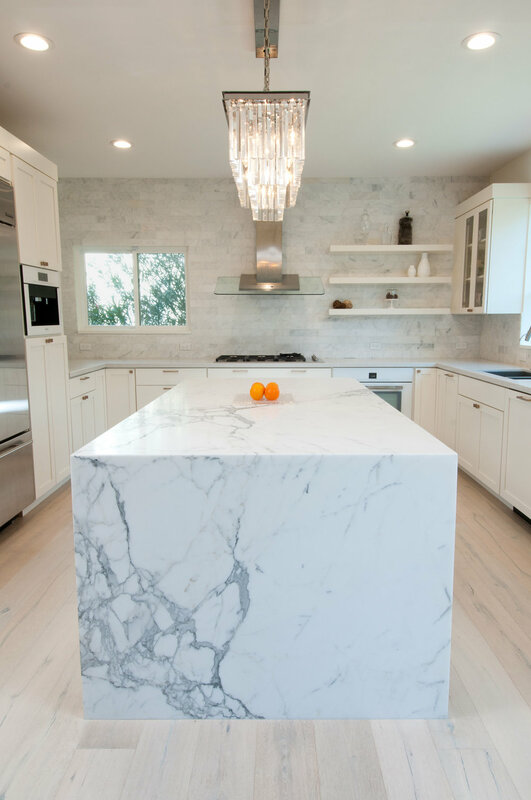 By combining traditional Feng Shui practices and heavy engineering, we shifted the flow and energetics of the home to suit the needs of this growing family. Deeply rooted in family tradition, these clients had a very clear vision of what they wanted for their “forever home” and it turned out beautifully. Over the last decade we've been fortunate to create many spaces for amazing and inspired people. We are so honored and sharing a few of our favorites, we celebrate all that represents "home."